1964年巴林货币局100 Fils, 1/4, 1/2 & 1 第纳尔。PMG Gem Uncirculated 65 EPQ & 66 EPQ. 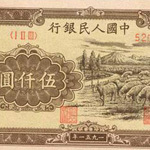 1964年巴林货币局10第纳尔。PMG Gem Uncirculated 66 EPQ. 1979年文莱政府1000文莱元，样票。PMG Superb Gem Uncirculated 67 EPQ. 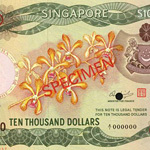 1989-92年文莱500元。PMG Gem Uncirculated 66 EPQ. 1989年文莱达鲁萨兰国银行500令吉。PMG Gem Uncirculated 65 EPQ. 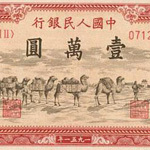 1944年缅甸国家银行100缅圆。PMG Gem Uncirculated 65 EPQ. 1948年缅甸政府5卢比。样张。PCGS GSG Choice Uncirculated 64. Details. Hinge Glue. 1946年东方汇理银行一元。样张。PCGS Superb Gem New 67 PPQ. 1953年法属印度支那。 柬埔寨，老挝，越南研究学院拾圆。PMG Gem Uncirculated 66 EPQ. 1951年东方汇理银行伍圆，库存票。PMG Gem Uncirculated 66 EPQ. 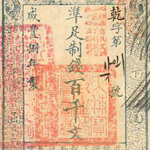 1951年东方汇理银行伍圆。库存票。PMG Gem Uncirculated 66 EPQ. 1909年东方汇理银行伍圆。样票。PMG Choice Extremely Fine 45. 1940年日本帝国政府军用手票伍圆。PCGS GSG Very Fine 30 Details. Washed. 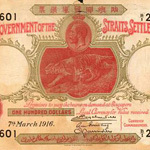 1943年印度储备银行100卢比。PMG Choice About Uncirculated 58.